On Saturday, the Crimson Tide hosted the UTC Mocs at Bryant Denny Stadium. The game was sealed by halftime with the Tide leading 35-0. 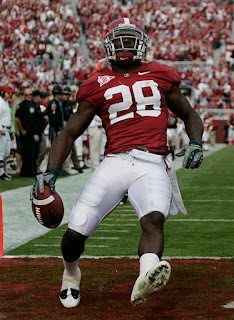 Mark Ingram added to his Heisman resume with 102 yards and 2 touchdowns, and once again Greg McElroy and Julio Jones connected a few times for some highlights of their own. The real story was the seniors of the team who may have played their best games in their final one at Bryant Denny Stadium. Senior Cory Reamer who has seen significant playing time with the loss of Donte Hightower this season, had his first interception of his career in front of the home crowd and family. Not only was it his last game at Bryant Denny, it was his final play there as well. Senior Javier Arenas also had an interception in his final game at Bryant Denny. However, his highlights came as he returned a UTC punt 66 yards for a touchdown breaking the SEC record for career punt returns for a touchdown. Arenas wasn't the only senior on special teams to put him name in the record book. Alabama's kicker Leigh Tiffin also tied two of the Crimson Tide's school records for field goals in a season and field goals in a career. Tiffin's 41 yard field goal on Saturday was his 25 this season and 78 in his career. Overall, the game went as planned for the Tide, and probably as good as a last home game could for the Tide's seniors. Destination: StarkVegas!!! Bring Your Cowbells!! !